An important difference is that unlike the Application and Session collection objects, which you can access by either key or numeric index, you can access cache items only by their key. You can also use this technique to store more than just strings. For example, the code in the following example, CacheAuthors.aspx, checks the cache to see if a dataset already exists. 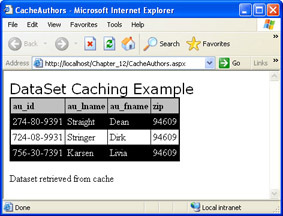 If not, it calls a method that creates a dataset containing data from the Authors table of the Pubs sample Microsoft SQL Server database, and then it saves that dataset to the cache before setting the DataSource property of an ASP.NET DataGrid control to the default view of the first table in the dataset (0). In this example, rather than adding controls via the designer, you will add controls in HTML view and then see the results in design mode. Visual Studio .NET is a true two-way design tool. In the same project as the previous exercise, add a new Web Form and type its name as CacheAuthors.aspx. Change the pageLayout property of the page to FlowLayout. Switch to Design view by clicking on the tab control at the bottom of the design window. The resulting screen should look similar to the illustration on the next page. Select View, and then select Code, or press F7 to move to the code window. Save the CacheAuthors.aspx and its code-behind file, and then build the project. Browse the page using Internet Explorer. The output should look similar to the following illustration. Note that the data was retrieved from the database. Refresh the browser, and the output will look similar to the illustration on the next page. Note that now the data has been retrieved from the cache. This data will remain in the cache until the app domain containing the application is recycled, or until the data is scavenged from the cache because of memory pressure. You’ll learn how to programmatically remove data from the cache later in this chapter. To use a trusted connection to connect to SQL Server (as shown in the preceding listing), you will need to either enable Windows authentication and impersonation or set up the ASPNET worker process account as a SQL Server login, as described in Chapter 9. The more complex answer to the question of how to remove items from the cache is that ASP.NET will actually do it for you. What makes this complex is that if you want to control how ASP.NET decides which items to remove from the cache and when it does so, you need to provide ASP.NET with that information when you add an item to the cache. You can do this by using the Add or Insert methods of the Cache class. Both methods let you pass parameters that tell ASP.NET when and on what basis to expire your cached content, as well as the priority your cached content should have when ASP.NET scavenges the cache for items that can be removed to free memory. 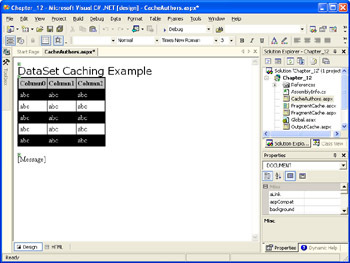 The Add and Insert methods of the Cache class provide essentially the same functionality, with two differences. The first difference is that all parameters of the Add method are required, so even if you are not using a particular parameter, you must still pass a placeholder parameter. The Insert method is overloaded, which makes it the easier method to use when you want to pass only some of the possible parameters. The second difference is that the Add method returns an object that represents the item just added to the cache, while the Insert method doesn’t return a value. You can also call the Insert method passing just the Key (String) and Item (Object) parameters, passing the Key, Item, and CacheDependency parameters, or passing the Key, Item, CacheDependency, AbsoluteExpiration (DateTime), SlidingExpiration, and (TimeSpan) parameters. In addition to using the Insert method of the Cache object to set up file and key dependencies, you can use helper methods available from the Response object—which is implemented by the HttpResponse class—to set up file and key dependencies for page output caching. Four helper methods are available: AddCacheItemDependencies, AddCacheItemDependency, AddFileDependency, and AddFileDependencies. Each helper method takes either a string or an ArrayList of strings as an argument. One of the biggest challenges in using caching in your application is how to get the most out of it, even when you’re dealing with data that either is frequently updated or must always be fresh. Setting absolute or sliding expiration times for a cached item can reduce—but not eliminate—the likelihood of a user getting stale data. What you need is a way to notify the ASP.NET cache when a table has been updated, in order to remove an item from the cache. Fortunately, the CacheDependency class and the SQL Server Web Assistant make this process easy. 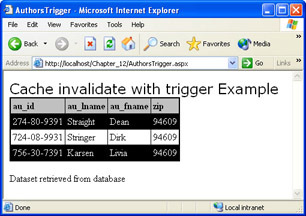 To force a cached copy of the Authors query seen in the CacheAuthors.apsx example to be expired whenever the data in the Authors table is modified, you need to first create a trigger on the Authors table that uses the SQL Server Web Assistant to write a new HTML file when the data in the table changes. Because MSDE, the desktop version of SQL Server, does not support the SQL Server Web Assistant, the following example requires the use of the full version of SQL Server. If you do not own a copy, you can download or order a trial version of SQL Server at http://www.microsoft.com/sql/evaluation/trial/default.asp. Right-click the Authors table in the table list, select All Tasks, and then select Manage Triggers. Make sure that the <new> item is showing in the Name drop-down list. Add the following text to the trigger, replacing filepath with the path to the directory where you have saved the examples for this chapter and the filename authors.htm (for example, C:\aspnetsbs\Chapter_12\authors.htm), and click OK. The second part of the process is to create the page that will use the cache by consuming the cached data. In the same project as the last exercise, add a new Web Form AuthorsTrigger.aspx. Follow the steps in the previous exercise so that AuthorsTrigger.aspx and its code-behind match the code from CacheAuthors.aspx. Change the Text property of the title label to Cache invalidate with trigger Example. In the GetData function, modify the connection string in the file to point to the SQL Server instance where you created the trigger. Save AuthorsTrigger.aspx (and its code-behind module) and build the project. If you click the Refresh button in the browser, the data will be served from the cache and the output will look similar to the illustration on the next page. To make sure this procedure was successful, open the Authors table in SQL Enterprise Manager (by right-clicking the Authors table and selecting Open Table, Return All Rows) and change one of the values in a row in the table that matches the query criteria for AuthorsTrigger.aspx (zip=94609). (Move the cursor off the row being updated to make sure the update occurs.) Now refresh the browser. Except for any data that you’ve changed, the output should look like the illustration that follows Step 8. While the preceding example is effective in purging the cached data when the underlying database table changes, there is a caveat to its use. Because this technique relies on the update of a file in the file system, it is possible that a problem with that file (such as incorrect permissions) could prevent the trigger from updating the file, which could lead to a blocking situation. Since what you’re after with caching is improved performance and scalability, clearly blocking would be a bad thing. So if you’re considering using a technique like this in your application, take care to minimize as much as possible the things that could go wrong and make sure to test the application thoroughly, particularly under loads similar to what you expect the application to bear.